I started when I was 8 years old playing kickball and youth football. My father was a punter in high school. 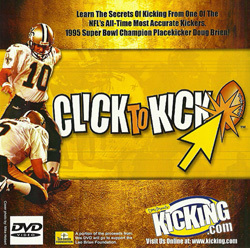 I was a semi-finalist in the Punt, Pass, and Kick contest my first year. I walked-on at East Carolina my freshman year and started without a scholarship. I didn't receive one for that year, so I transferred to the University of North Carolina at Chapel Hill and sat out the following year. I started the next three years and I received a scholarship playing at Carolina. I began working with a Sports Psychologist (Dr. John Silva at the University of North Carolina), who has helped me to become the person and athlete that I am today. My senior year, I created all the field position, and was voted MVP of the team by my teammates. I was 1st Team All-Atlantic Coast Conference and 2nd Team All-American. I was then drafted in the 9th Round of a 12-round draft. I was the 3rd punter in the draft taken by Tampa Bay Buccaneers. I was cut after Training Camp and went back to Chapel Hill to work for a friend in the shoe business/securing guard. I signed with the New Orleans Saints during the strike games and played very well (43.4 avg, 37.8 net). They cut me and then I was picked up by the Chicago Bears for the end of the '87 season. I was released by the Bears after training camp. I was going to retire and got talked out of it by the General Manager of the Washington Redskins (Bobby Beathard). I worked out for them and signed for the '88 season. I was cut by them before training camp. I was then picked up by the Detroit Lions for camp and was then released again. The fourth game of the season, the New Orleans Saints signed me and I played there for 6 years before I signed with the Carolina Panthers for one year in 1995. I was signed by the Tampa Bay Buccaneers in '96 and re-united with my Coach Joe Marciano. I was in Tampa Bay for 3 years before going back to the New Orleans Saints in 1999. 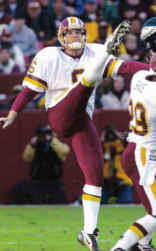 The last team I played for was the Washington Redskins in 2000. I hope to play a couple more years. It's a chance to make something exciting happen and create field position. It's a hidden way to help your team win. People don't give us enough credit in terms of our influence on a game, unless we make a mistake. I pride myself on being mentally tough and not letting anyone disrupt me mentally. I try to be versatile, to do everything good, and not be great in one dimension. My weakness would be trying to get to cute with placing the ball from the 50-yard line inside the 20 yard line. I work as hard as I can, and DO NOT TAKE SHORTCUTS!!! I will outwork any other punter out there. My discipline is a big factor, not only in working out, but also in my nutrition habits. The membership contains more information about my diet. You have to be persistent and not let go of your DREAM! Keep fighting no matter what happens! DETERMINATION, ATTITUDE, PERSEVERANCE AND HARD-WORK !!! In my career now, I do more mental work during the week than I do physical kicks: I put myself in game situations and situations where the outcome is not the result I want. I learn how to cope and keep everything in a positive attitude! Crossing over during the NFL Players strike in 1987 and playing in the strike games as a "scab." It was just the experience to get into game situations, and it allowed me to play the whole game. The only superstition I have is that I make sure the writing on my socks are not on top of my punting foot. Single leg squats and dumbbell step-ups. For Cardio - I do the STAIR STEPPER. My-day-before-the-game routine was to just watch practice film of the week. Mental preparation of all the situations that I thought might come up in the game. I would wake-up, shower, and go down to eat pre game meal. Egg whites, pancakes, oatmeal, and fruit. (No caffeine). I would go over 3 hours before the game and get taped. I would get dressed with my pants, shoes and sweatshirt. I walked out onto the field and took over the field as MY TERRITORY. Then I would STOMP on the ground, lean over and pick-up some dirt and say, "This is my home away from home." Then I would go to each goalpost and check the wind along with the turf on each hash mark . I would walk from one end of the field to the other end, check out the turf along the hash marks. Pick out targets in stadium, if we're punting directionally, and maybe see myself punting a ball in the game. Then I would go back inside to stretch and get ready to warm-up. 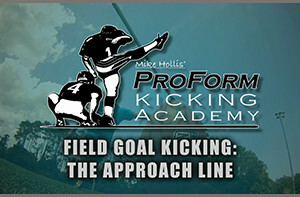 I start my warm-up with the snapper on the +40 yard line and work my way back to the 50; then I would go to the end zone and punt a few out of the end zone to see how the conditions are in the end zone. My favorite motivational quote: DON'T EVER GIVE UP, JUST GIVE OUT!!!! Thanks for making this website and making it free. I really appreciate it!